Think it was Spiny who origionally told us about this software called Freemind. 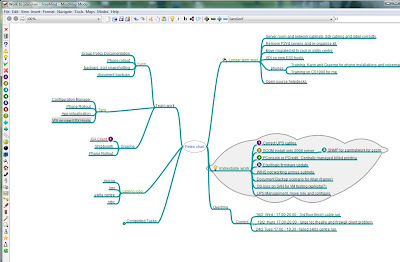 It's an open source mind mapping bit of software which is a complete doddle to use. Thankfully the guy included a great wee video about how he anally keeps track of his every minute in a mind map, which he can export to excel. Allowing him to bill people as he goes. I've got a new remit at work and was struggling under the variety of tasks to keep juggling, so put in a wee mind map for current/future work and it's all being handled very easily. Well so far. I still find it a bit clunky, and the onmouseover way it selects what you're actively targetting is quite annoying. But well worth a punt for nothing! I've been using it for a while as my job entails juggling multiple small projects right now and it's bloody marvellous. I get the feeling I'm only tapping on the surface of the application though, the potential I can see to make my life a lot easier is right there. Can't just download the multi os zip archive, extract & run? Tried that for 15 minutes tonight and it is very very useful. One particularly good use for this if you are overloaded to get all your tasks down in one place. There's some very good practice that shows that the brain is simply no good at trying to hold all of the tasks you may need to do and that 'offloading' it to a system like this reduces your stress and habit of remembering you haven't done task x at precisely the time where you can't do anything about x but end up fretting about it. A distrubing view into the inner machinations of Pete's mind. Does the beer drinking tree feature in a seperate workbook?